I ordered some Dinkydoodle airbrush colors the other day and made a few ‘practice’ cookies so I could try them out. I loved the coverage. Holy cow! Green is green and blue is blue and the red…it is RED! I thought I died and went to airbrush color heaven! 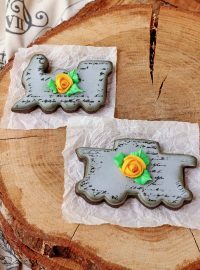 I was so excited I baked some plaque and dinosaur cookies so I could create something that has been on my mind for quite some time. I saw a picture at Hobby Lobby that had the RAWR and Chevron background for the dinosaurs and I fell in love. So I cookiefied them and made these super fun airbrushed dinosaur cookies. What do you think? I love the backgrounds with the vibrant colors of the Dinkydoodles. Before you go all crazy buying Dinkydoodles (like I did) there are a few things you should know. The Dinkydoodles are not water based like the AmeriMist colors. They are actually Ethanol based and they dry almost immediately. For those of you wondering what Ethanol is it is basically drinking alcohol. They are a little on the expensive side. It will turn the cup of your airbrush gun the color as your airbrush color. The colors don’t just rinse out of your airbrush cup. You need to get a Q-tip with a little water or vodka and rub the inside of the cup to remove the colors. I have done this several times and my airbrush is fine. I haven’t had to take it apart to clean it after using them. I still clean it with vodka and rinse it like I do every time I use it. The only thing new is the cup cleaning process. I haven’t tried the Liquid Shiny yet but I am checking into it and will let you know what I find out. 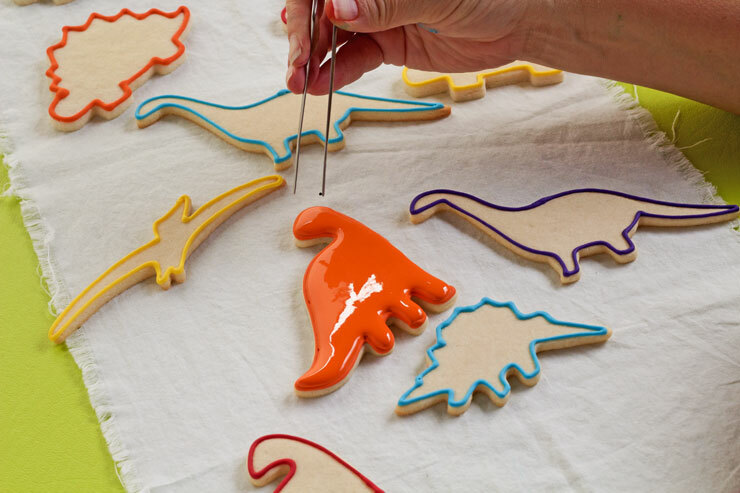 Let’s make some dinosaur cookies! I know the supply list looks long but you probably already have most of the stuff you need to make these. I just wanted to list everything I use while making these bad boys. There are some things that are optional like the Stencil Genie and Dinkydoodle Airbrush Colors but I wanted to show you where I got them in case you want to find them. 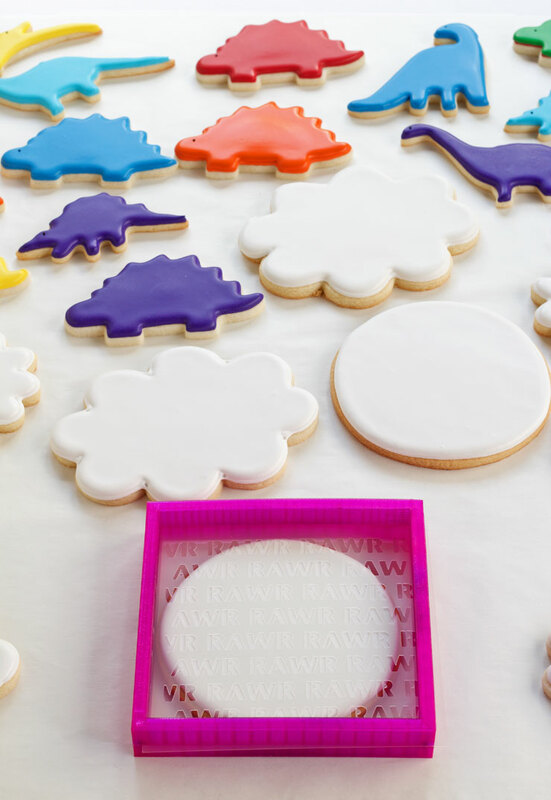 Bake some dinosaur sugar cookies and plaque or circle cookies large enough to hold your dinosaur cookies. 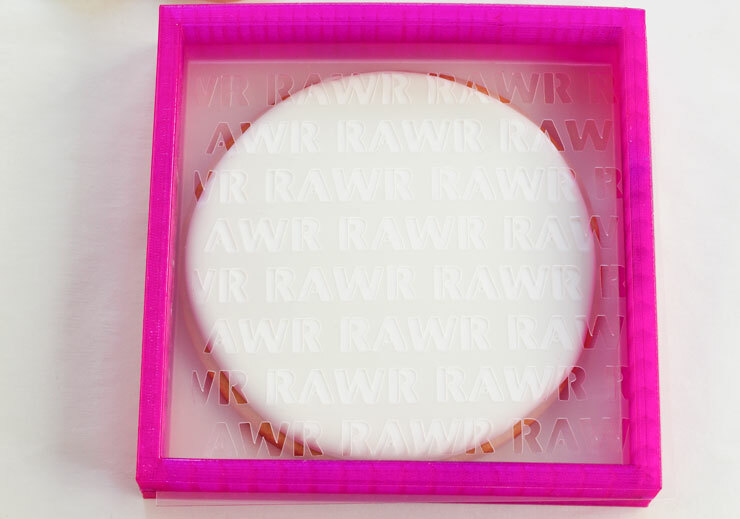 If you don’t have a plaque cutter that is large enough, you can use a flower cookie cutter that you smooch a little. The orange dinosaur on the green chevron cookie is my flower cookie cutter. 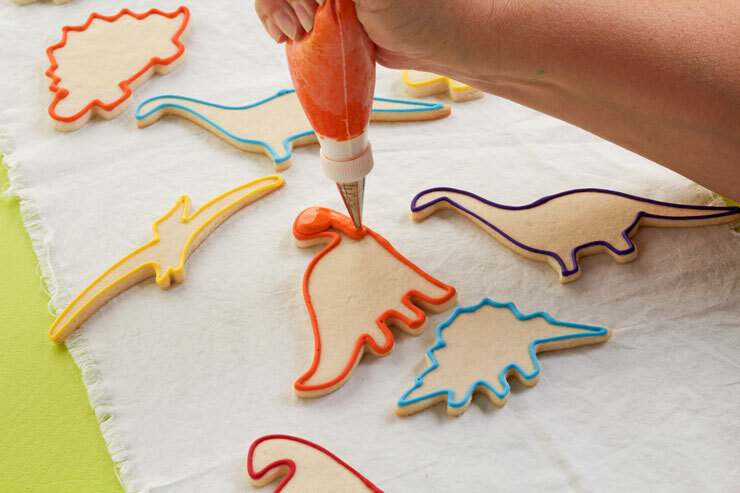 Outline your dinosaur cookies in the colors of your choice. I used piping bags fitted with #2 decorating tips. 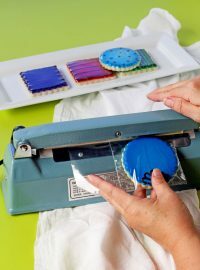 Outline and flood the plaque and circle cookies with white icing. I was so excited about these cookies I forgot to take a photo of that step. Oops! Set them aside and let them dry completely. Add a black nonpareil for the eyes. 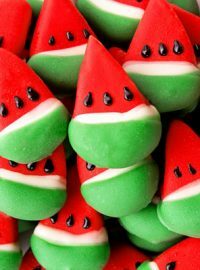 If you prefer, you can add a dot of black icing or use a food safe marker so you don’t have to mix another color. 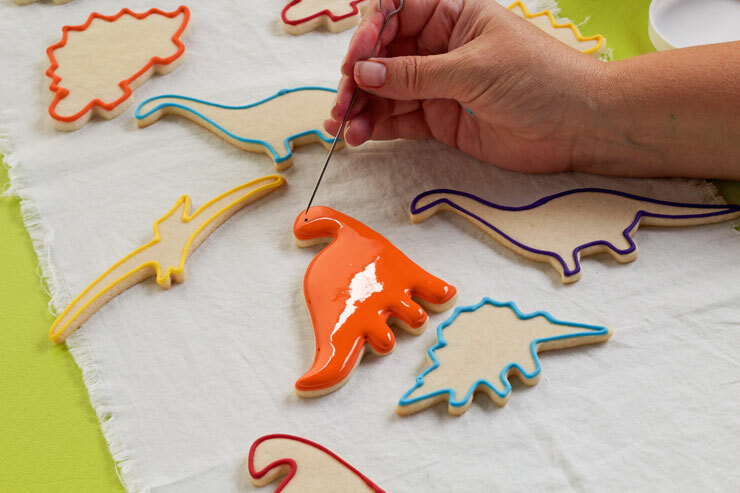 Let the dinosaur cookies dry completely. Next comes the fun part. Stenciling! I can’t tell you how much I love my Stencil Genie! It is the most amazing thing I own that helps with airbrushing cookies. 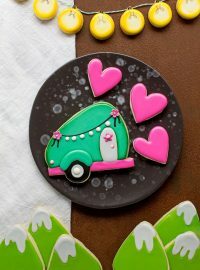 If you want to see more on this, here is a post I did a few weeks back called Stenciling Cookies with an Airbrush Gun. It will show you the different side and how to use this. Hillary at The Cookie Countess made this RAWR stencil and I love it. 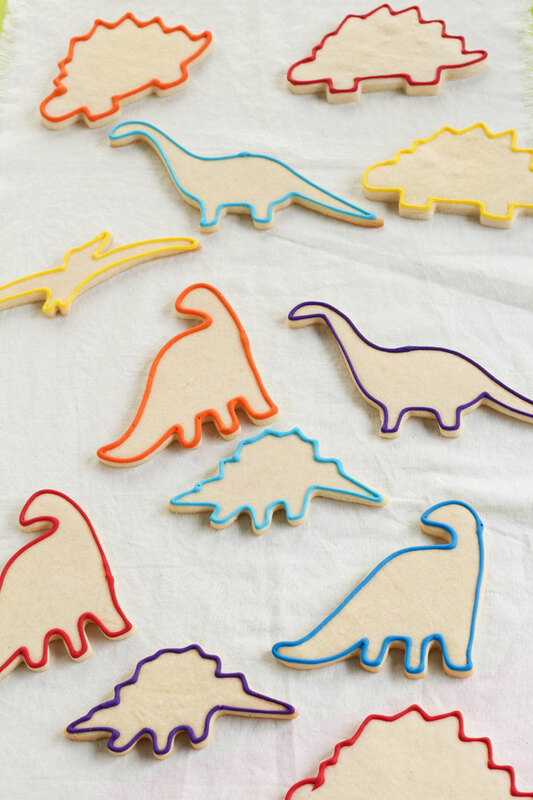 You can use it for dinosaur cookies, lions, bears and so many other things. While I was decorating, something happened. A dinosaur massacre took place. Poor dinosaur. Sigh. The reason the cookie and table are covered with the red airbrush color is because I over filled the cup and then tipped it to the front and spilled the colors all over the place. oops. 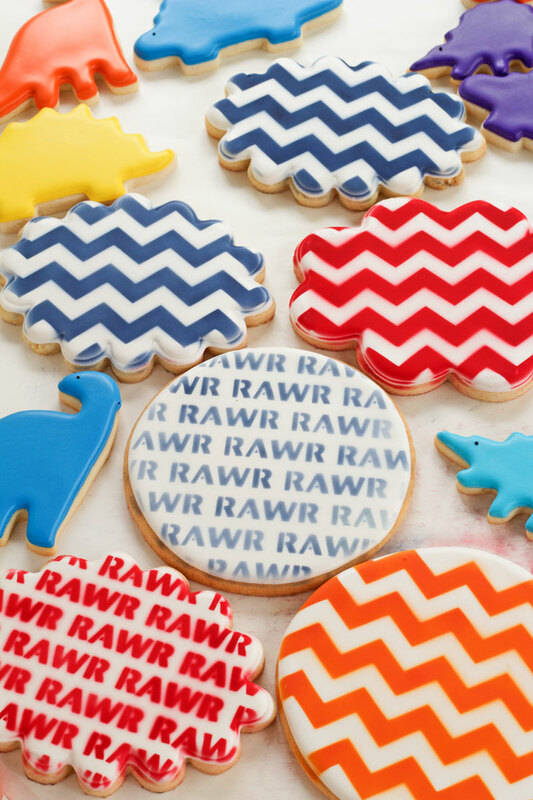 Check out this Chevron and RAWR pattern. As you can see in the video, you can get full coverage with the Dinkydoodles or you can use a lighter spay for a more subtle background. I can’t wait to make a lion cookie. Well there you go. 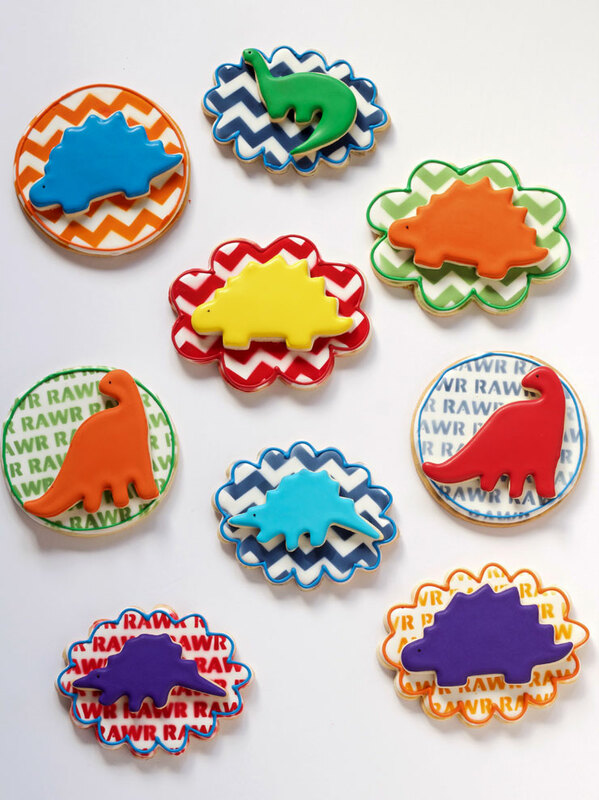 Dinkydoodle dinosaur cookies with some really awesome and vibrant background cookies. Now I need to make a volcano and have a dinosaur party! Wait…you clean your airbursh with vodka? You take it apart and clean it with vodka? Straight, or diluted? YES! Clean it pure vodka! 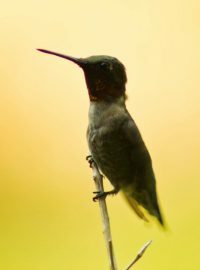 Here is a post for you. I also rinse it out with vodka every time I use it. I just spray it through the cup like water. I don’t have to take it apart and clean it anymore . The vodka works! 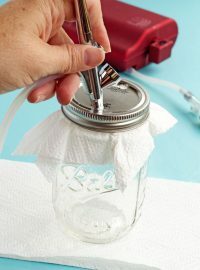 I saw the mason jar you repurposed for cleaning your gun, but, I must have been in my “I’ll NEVER airbrush” mood when you wrote this post. Thank you!!!! I too have invested in the Dinky Doodle airbrush colors and love them. What else do I love???? 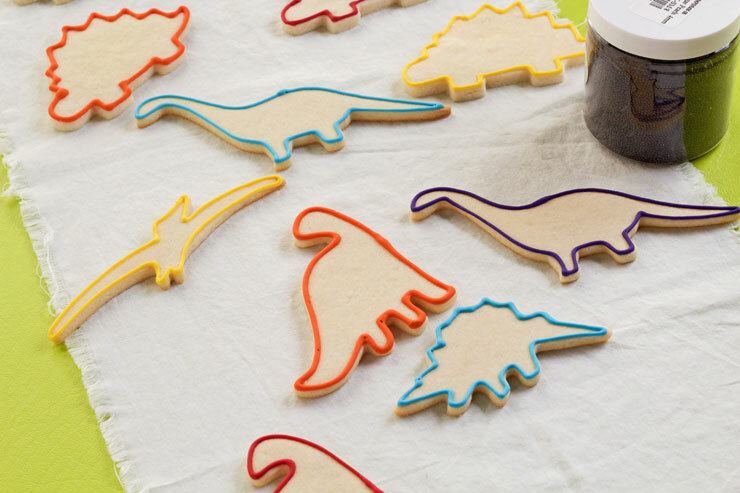 Your adorable dinosaur cookies – ROAR! They are wonderful!!! I am glad you like them too! I’m confused about something ?. You said sinky doodle dinosaur cookies, but the Dino’s aren’t airbrushed, they’re flooded. Please explain. Love these cookies by the way and thanks for the vodka tip! I’m having some airbrush cleaning issues over here!! 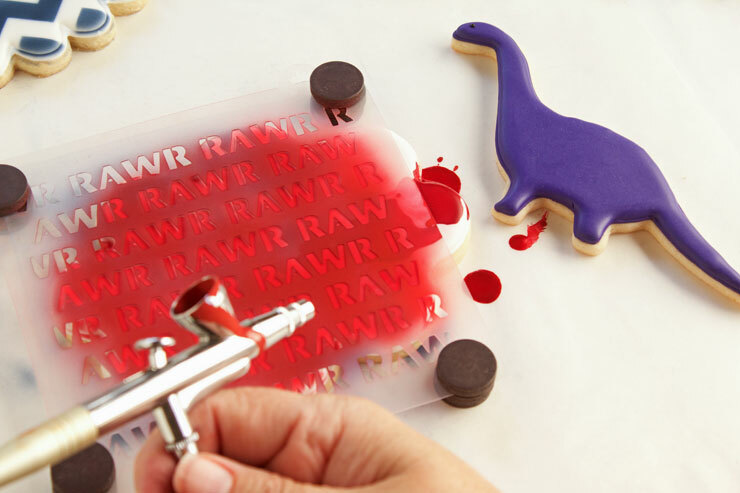 Where can I get the “rawr” stencil? When I click on the link, it says “page not available.”. 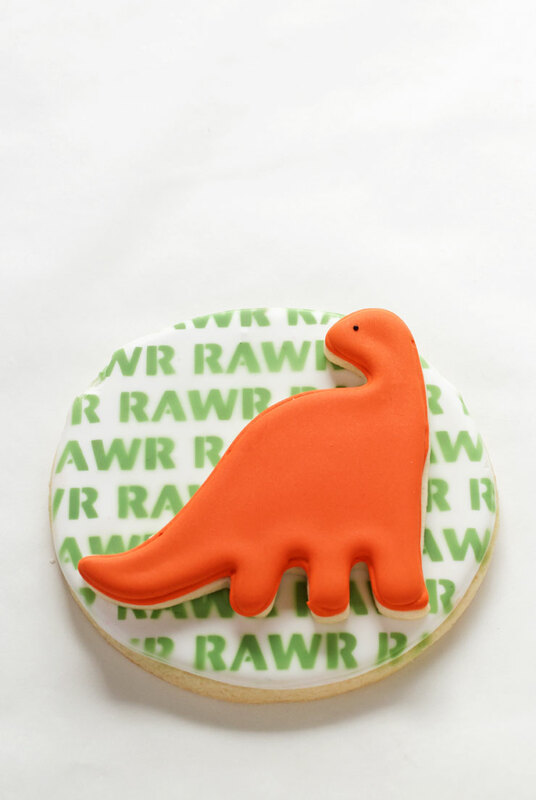 I am making cookies for a dinosaur themed party and really want to use this. Thank you!